Built in the early Showa era, the Count Ogasawara Residence is the authentic residence of nobility. The tradition and formality of the setting can be claimed for the exclusive use of weddings and will provide for an elegant and luxurious day straight out of a foreign film. The couple can freely welcome guests as masters of the residence. Weddings at Ogasawara-Hakushakutei do not have seating that confines the couple and their guests. In the garden where olive trees, symbols of happiness in Spain, watch over the couple, or in the cloister that gently opens out into the garden, or in the parlor set with sophistication and formality, conversations among new friends and family blossom. Ogasawara-Hakushakutei, where your ideas can shape an endless variety of reception services. The moment you step into the Residence, your imagination will begin painting your perfect day. Your very own, one-of-a-kind stage for wedding ceremony. 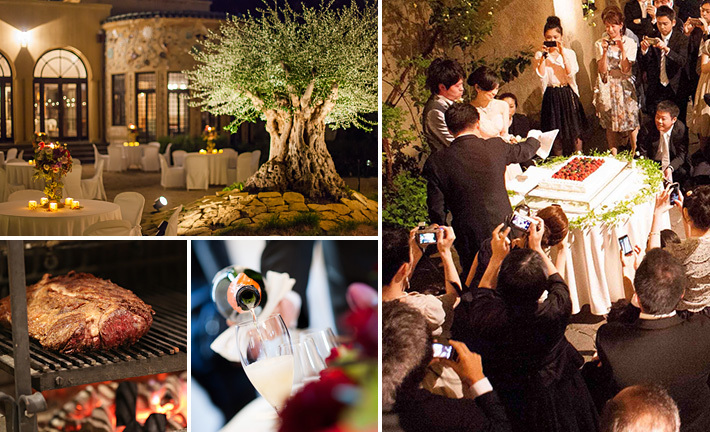 A 500-year old olive tree stands in the center of an expansive garden where a gorgeous garden tent awaits. Please stroll over to the glowing white marble floor surrounded by lush greenery and seasonal flowers. 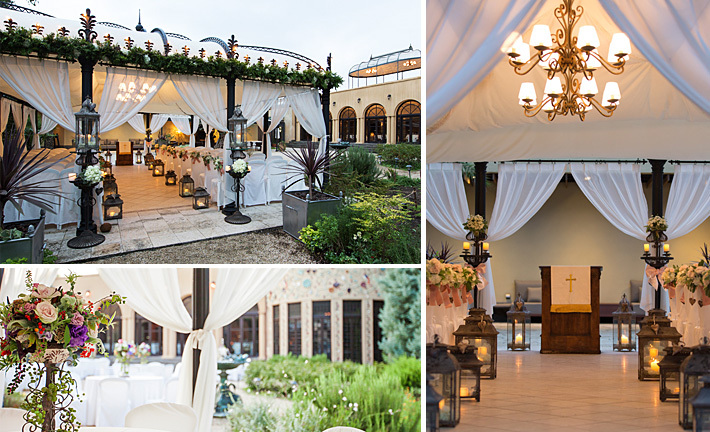 The ceremony will be drenched in bright lights that gently cascade from the high ceiling above, and an altar will be set inside this Italian tent, transforming it into a private chapel. Under an infinite blue sky, as though taken from a beautiful painting, your wedding will be inlaid with an infinite number of memories. Approximately 60 seated guests can attend. 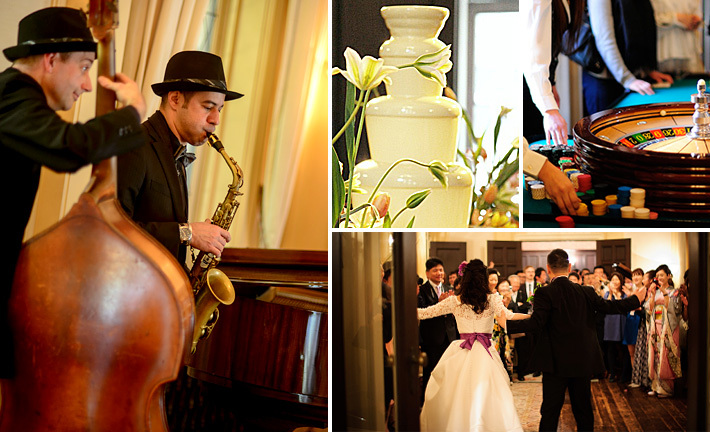 The style of the wedding you choose, whether a church wedding or civil wedding, is simply a matter of your preference. A wedding in Ogasawara-Hakushakutei is not merely a stage for displaying the bride and groom. Nor is it a venue of cramped seating where guests feel clamped. It is our desire that no matter where the couple and guests gather, they are provided the freedom to relax and enjoy each other's company. The entire Residence are provided for parties where pintxos-full-course meals are served to guests in bite-sizes. The couple and guests can enjoy food and wine in the lounge under a glittering chandelier, or enjoy sizzling grilled dishes in the garden decorated with celebratory fountains and flowers, or enjoy cake in the patio of timeless decor. For this day that marks the beginning of a couple's new life together, dreams come true in the Ogasawara-hakushaku-tei style. On this day of happiness, the Ogasawara-Hakushakutei will present the couple with a history clad in high elegance and personalized services. Dedicated artists will decorate the couple's glorious day with flowers. In the lounge that previously served as the parlor, a beautiful antique piano will provide live music for the guests' enjoyment. A surprise dance by the bride and groom. A fabulous chocolate fountain and casino to entice guests into having some fun. There is no end to the celebratory entertainment.